Why theater? : It's live and completely unlike any other art form. The flesh and blood aspect of it never gets old. And it's very hard to get right. Tell us about Wyoming: It's a play about a family that's trying to avoid the past. Their estranged and silent brother is spotted at a hometown diner twenty years after a confounding childhood crime and his return uncovers some buried memories and unspoken bounties, hatching a quite eventful Thanksgiving. It's a ensemble piece that explores the places and people we come from and the fragile power that memory holds over family. We have an excellent team all around with a cast that will knock your socks off. The play is heavily reliant upon music as a tool for understanding Time, so we've enlisted original music to be composed by Robin Pecknold and Neal Morgan, who have done some beautiful work. Robin is my cousin, and so it was a joy to collaborate with him on this, as his sound is an absolutely a perfect fit for the world/tone of the play. Add some great designers and the stellar work of the producers at Lesser America and I think we've made a great night of theatre. What inspired you to write Wyoming? : I'm interested in the elusiveness of memory and the stakes that it holds in our relationship to family history. This is directly affected by the land our family occupies, and I wanted to write something that contrasted the permanence of that land with the temporality of its inhabitants. We all have a connection to the past, and I find it's typically more mysterious than concretely fathomable. This is the flint that sparks the dramatic action in Wyoming (I hope). What kind of theater speaks to you? What or who inspires you as an artist? : Theatre that is muscular and unexpected and stories filled with characters whose choices are oddly defined by environment. I love plays that see the stage as a kind of altar for Americans shaped by the history of the land they live on, or moonstruck by the culture and heritage they keep. It's always shifting but one thing that's remained constant is a continual fascination with where people are from (i.e. Place). For me, Place is the gathering agent yet totem of individuality that shapes society. In it's best form I think this expresses a distinctly American conflict, that is, characters driven by instincts that are at once territorial and transient. Some of my favorite artists that do this are Bruce Nauman, Flannery O'Connor, Cormac McCarthy, Sam Shepard, Faulkner. If you could work with anyone you’ve yet to work with, who would it be? : Tough question, as the people I'm working with right now at Lesser America are some pretty great folks. People that can do more with less are the best kind of artists in my eyes. What show have you recommended to your friends? 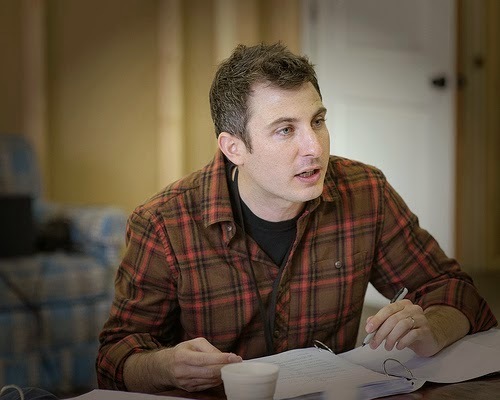 : More recently, Scenes From a Marriage at NYTW and Father Comes Home From The War at the Public. Jez Butterworth's The River was pretty damn good too. I'll see anything he writes. Who would play you in a movie about yourself and what would it be called? : Jim Varney, "Ernest Goes to Camp"
What’s your biggest guilty pleasure? : Barbecue/beer. If you weren’t working in theater, you would be _____? : Probably writing in some other capacity. What’s up next? : Wyoming plays with Lesser America until the end of the month so come see it while you can. Then I'm headed off to Colorado for a reading of the play with Local Theatre in Boulder as part of their Lab series.